Graham’s Nolan Gessler (106) works to control Perkins’ Max Oprzadek in the state semifinals on Sunday afternoon. Gessler finished with a 10-2 major decision and earned his team four points. Graham’s Trey Pence (right) battles with Aurora’s Colin McNamara at 220 pounds in the championship round Sunday. Pence’s ultimate tiebreaker loss actually sealed the win for Graham, as Aurora needed a technical fall or pin to avoid mathematical elimination. COLUMBUS – Graham won its seventh straight team duals championship Sunday night at St. John Arena. The Falcons have won a championship in each of the event’s seven years of existence, having moved up to Division I last season and winning that title to go along with six Division II trophies. Graham defeated Aurora, 38-24, in the final on Sunday night to clinch the D-II championship. Graham had what looked to be an insurmountable lead before Aurora rattled off five wins in a row from 160 pounds to 220. 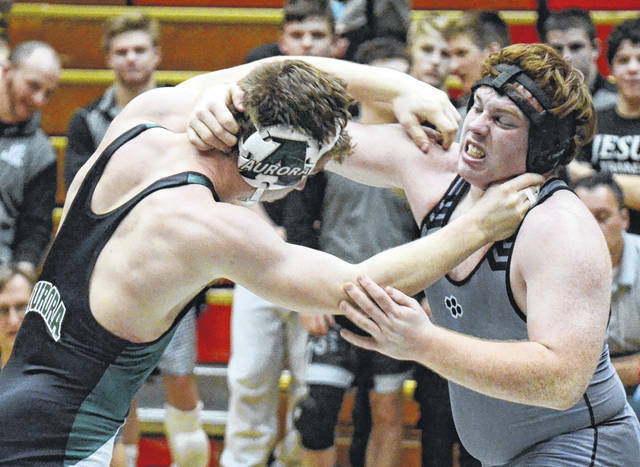 The Greenmen technically weren’t mathematically eliminated until Trey Pence lost his 220-pound match for Graham in the ultimate tiebreaker – a loss that didn’t surrender bonus points. A match earlier, William Mannier suffered a shoulder injury early in his 195-pound bout, but gutted it out for a 6-3 loss, keeping Aurora at bay. In the evening’s final match, Johnny Shafer (285) put the exclamation point on the Graham victory with a pin of Aurora’s Marcus Barroun. The bonus points snapped a five-bout losing streak for the Falcons. Nick Moore (132) added six points to the Falcons’ total with a forfeit victory and Jack Mefford (145) added his own six points with a pin when he looked dead in the water. Losing 5-1, Mefford looked like he may take a fall of his own before he turned things around and pinned Kyle Peterson, stunning the Aurora faithful and igniting the Graham bench. Nolan Gessler (106), Dawson Show (120), Chris Kelly (126) and Alek Martin (138) also added bonus points. It was the first state championship for McIntosh as a head coach in his first season taking over for the uber-successful Jeff Jordan. In the afternoon semifinals, Graham rolled over Perkins, 58-13. Trace Braun (113), Chris Kelly (126), Nick Moore (132), Alek Martin (138), Jeffrey Thomas (152), Isaiah Stickley (160) and William Mannier (195) each earned six points for the Falcons via pin. Johnny Shafer (285) got a forfeit. Nolan Gessler (106) earned a major decision and Dawson Show (120) and Jack Mefford (145) earned decisions. In the morning’s quarterfinals, Graham defeated London, 62-8. Graham lost just two matches, with Antwaun Burns taking down Jack Mefford for a technical fall at 145 pounds and Darian Huff earning a decision over Eric Thomas at 170. Every other class belonged to Graham, with Trace Braun (113), Dawson Show (120), Nick Moore (132), Alek Martin (138), Isaiah Stickley (160) and Johnny Shafer (285) earning bonus points with pins. Nolan Gessler (106), Jeffrey Thomas (152) and Nolan Neves (182) each earned tech falls, with Chris Kelly (126) and William Mannier (195) getting major decisions. 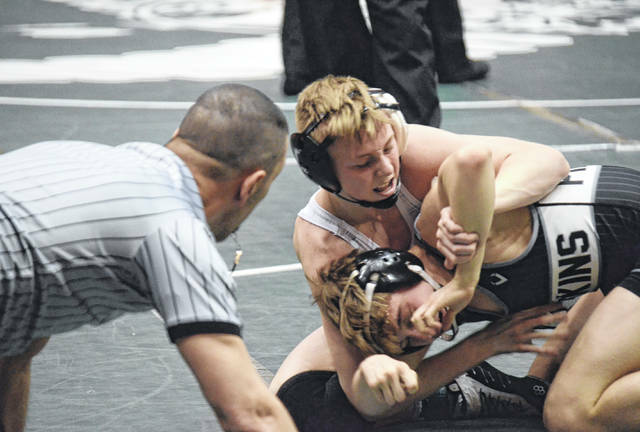 PLAIN CITY – The West Liberty-Salem Tigers wrestled at the Ron Thomas Invitational at Jonathan Alder High School on Saturday. Major Stratton placed second in the 195-pound class. Stratton was 4-1 with 4 pins. Hayden Phillips (126), Shawn Casto (220) and Kyle Wolfe (285) also added pins for the Tigers. https://www.urbanacitizen.com/wp-content/uploads/sites/36/2019/02/web1_NolanGessler021019_ne201921017413779.jpgGraham’s Nolan Gessler (106) works to control Perkins’ Max Oprzadek in the state semifinals on Sunday afternoon. Gessler finished with a 10-2 major decision and earned his team four points. https://www.urbanacitizen.com/wp-content/uploads/sites/36/2019/02/web1_TreyPence021019_ne201921022346143.jpgGraham’s Trey Pence (right) battles with Aurora’s Colin McNamara at 220 pounds in the championship round Sunday. Pence’s ultimate tiebreaker loss actually sealed the win for Graham, as Aurora needed a technical fall or pin to avoid mathematical elimination.